Latest nmap 4.50 is out. Must upgrade! 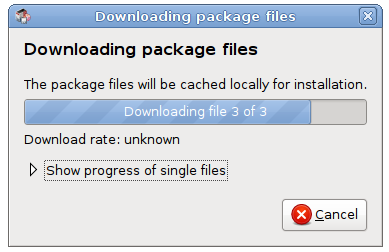 Apturl allows to install Ubuntu packages using apt:pkgname like syntax with any compatible browser like Firefox, Konqueror or other. Let me note that apturl comes with Ubuntu Gutsy 7.10 by default and is very useful while placing links through manuals, howtos etc. 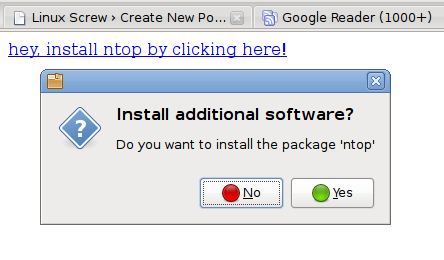 For example, to install ntop utility in Ubuntu I’d suggested to run the following command from terminal: sudo apt-get install ntop, but now I can just place the link like this: hey, install ntop by clicking here! I hope this would be useful for bloggers writing manuals for Ubuntu Gutsy users. Real thanks apturl’s author Harsh J (aka Qwerty Maniac).